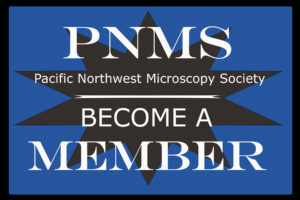 The name of the Society shall be the Pacific Northwest Electron Microscopy Society. 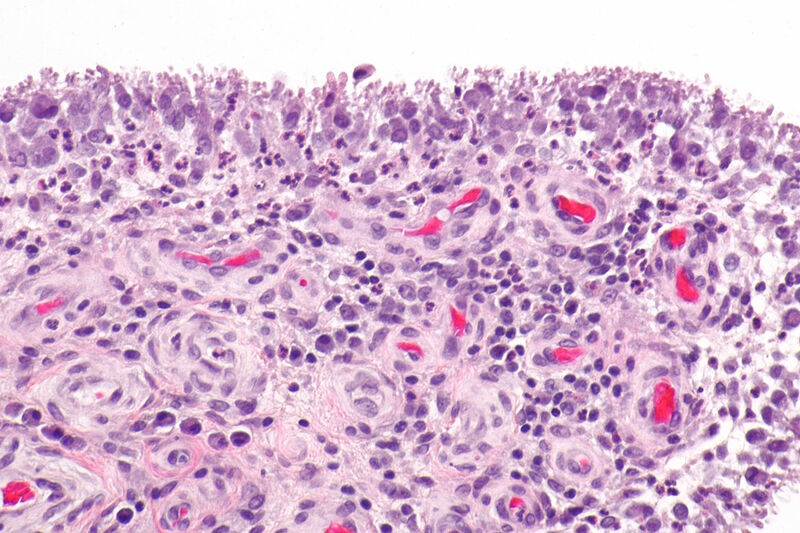 (a) To advance the knowledge of the theory and applications of electron microscopy and associated techniques, and to aid in the communication of results obtained by their usage both in physical and biological sciences. (b) To establish a non-profit Society interdisciplinary in nature, which shall actively promote fellowship, exchange of ideas and a sense of community among its members. (c) To pursue such other educational and scientific purposes as the Executive Council may determine. Any individual, institution, agency or organization interested in promoting the purposes of the Society is eligible for membership. (a) Regular – Regular members shall be assessed annual dues to be determined by the Executive Council. (b) Corporate – Corporate members shall be defined as any participating organization, business or corporation and shall be assessed an annual dues as determined by the Executive Council. (c) Student – Student members shall include any full time students and/or the spouses of full time students and they shall be assessed an annual dues as determined by the Executive Council. If regular dues are paid, students can become regular members. (d) Patron – Patron members shall be those individual members who contribute annually to the Society an appropriate amount as determined by the Executive Council. The amount of annual dues shall be set by the Executive Council, and shall become payable on January 1 of each year. Any member delinquent in the payment of dues for a period of one year shall be removed from the membership. Meetings of the Society shall be held at such time and place as may be designated by the Executive Council. There shall be a minimum of one meeting per year. The elected officers of the Society shall be a President, President-Elect, Immediate Past President, Secretary, Treasurer, Program Director, and Program Director-Elect. The President-Elect shall serve one year as such, one year as President, and one year as immediate Past-President. The Secretary shall be elected in even-numbered years and serve for a two year term. The Treasurer shall be elected in odd numbered years and serve for a two year term. The Program Director-Elect shall serve one year as such followed by one year as Program Director. The installation of incoming officers shall be at an annual meeting to be determined by the Executive Council. All officers shall arrange for the orderly and timely transition of offices within 30 days after the installation of officers. However, all officers shall continue to perform the assigned duties of the office until relieved by the successor. The officers shall constitute the Executive Council. If any member of the Executive Council is absent from three consecutive Executive Council meetings, the remaining members of the Executive Council shall have the option of appointing a successor. Any officer shall have the authority to contract with other individuals or organizations with the prior approval of a majority of the Executive Council. 1. President – shall preside at all meetings of the Society and at meetings of the Executive Council. The President shall conduct the business of the Society between Executive Council meetings. 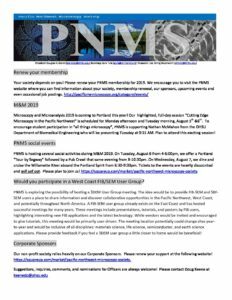 The President shall represent the Society at the annual meeting of the Electron Microscopy Society of America. 2. President-Elect – shall assist the President and substitute for that office in the occurrence of an absence. 3. Immediate Past President – shall assist the President, Executive Council, and Executive Committees. 4. Secretary – shall maintain the records of the Society other than financial, and distribute announcements to the membership. 5. Treasurer – shall be custodian of the Society funds and shall account for them in accordance with accepted business practice. The Treasurer shall be responsible for the paying of the debts of the society; and the Treasurer’s signature shall be authorized by the society as its legal financial representative. The Treasurer’s records shall be examined annually by an internal audit committee chosen by the Executive Council. A written report of the internal audit shall be presented to the Executive Council and the membership at the meeting following the audit. 6. Program Director – shall be responsible for organizing the various scientific activities of the Society. The Program Director shall not commit any funds of the Society unless authorized by the Executive Council via an approved budget or as authorized by the President and Treasurer under conditions of exigency. The Program Director is responsible for the appointment of local arrangement committees. 7. Program Director-Elect – shall assist the Program Director and act as a substitute in the absence of the Program Director; while extending the planning of subsequent programs into the following term of office. The appointed officers of the Society shall include, but not be limited to, the Newsletter Editor and the Student Representative. These appointments shall be made by the Executive Council. 1. Newsletter Editor- shall publish a newsletter promoting the purpose of the Society. The newsletter shall be published a minimum of once a year, or as ordered by the Executive Council. The term of appointment shall be for two years and may be renewed. 2. Student representative- shall represent the student membership of the Society on the Executive Council. The term of appointment shall be for one year. In February of each year the Executive Council shall appoint three regular members to serve on the Nominating Committee with the Immediate Past-President, the President Elect, and the Secretary. The Secretary shall Chair the Nominating Committee. The Nominating Committee shall nominate two candidates for each officer position becoming vacant that year. In preparing the slate of nominees, due consideration will be given to the geographical area and field’s of interest represented by the membership of the Society and to the nominees’ previous participation in the Society’s affairs. The Secretary shall appoint a member of the Nominating Committee to ascertain the willingness of each nominee to serve if elected. The report of the Nominating Committee shall be announced to the regular membership by March 1. Additional nominations may be initiated by the membership by a petition to the Secretary signed by a minimum of ten of the regular members. Such petitions must be received by the Secretary by March 15. Ballots shall be mailed to the regular members in March and shall be accepted by the Secretary until April 15. The Secretary shall count the ballots and announce the results by mail out to the membership. The candidate receiving the largest number of votes for each office shall be elected. There shall be no runoffs. In the event of a tie vote, the outgoing officers and the Nominating Committee shall decide the winner. The new officers shall assume their duties at the conclusion of the annual meeting at which their election is announced. A two-thirds vote of the entire membership of the Executive Council shall remove any officer or appointee derelict in their duties. The Executive Council shall accept resignations in good faith. An interim vacancy in the presidency shall be filled by advancement of the President-Elect, who will go on to serve the anticipated term as President and immediate Past President. In the event there is no President-Elect to advance, the Executive Council shall elect one of its members as acting President to serve until the completion of the next regular election. An interim vacancy in the Program Director shall be filled by the Program Director-Elect, who will go on to serve the anticipated term as Program Director. If there is no Program Director-Elect to advance, the Executive Council shall appoint a Program Director to serve until the completion of the next regular election. Interim vacancies in the offices of Secretary or Treasurer shall be filled by appointment by the Executive Committee until the completion of the next regular election. Interim vacancies in the offices of Newsletter Editor or Student Representative shall be filled by appointment of the Executive Council. 2. Petition of at least 10% of any members in good standing. The proposed amendment shall be discussed at the next scheduled meeting of the Society. Following this, any active petition shall be mailed to the membership along with signed statements of support or opposition. Ballots for the amendment shall be accepted by the Executive Council for thirty days after the date of mailing. The Executive Council shall count the ballots and the amendment shall be ratified if it receives a simple majority of supporting votes from the ballots cast. Upon the dissolution of the Society, the Executive Council shall, after paying or making provision for the payment of all of the liabilities of the Society, dispose of all of the assets of the Society exclusively for the purposes of the Society in such manner, or to the Electron Microscopy Society of America. Any such assets not so disposed of shall be disposed of by the Court of Common Pleas of the county in which the principal office of the Society is then located, exclusively for such purposes or to such organization or organizations, as said Court shall determine, which are organized and operated exclusively for such purposes. These by-laws shall become effective by majority vote of the Executive Council.